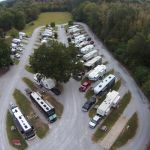 Ask fellow campers about "Benchmark RV Park" and nearby attractions. Good park for an overnight stay. We were just passing through. No real amenities other than bathrooms and laundry - both of which were clean. Convenience store across the street. Easy access via US45. 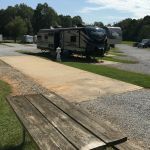 We camped at Benchmark RV Park in a Motorhome. Cracker Barrel and a number of other restaurants within 5miles on I20/59. The park was an easy on and off for I-20. Nothing but a good place to pull in for the night to continue going. Wifi was only good at the laundry room. Sites were tight. 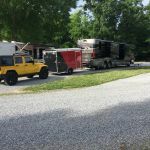 We camped at Benchmark RV Park in a Motorhome. Okay Campground for an overnight stay. We have stayed here a few times over the years. I have always noticed the around the power connection stand it is muddy. However this time water was standing all around the power stand. Obviously this is very dangerous. This is an easy problem to resolve with a little gravel placed around the power stations. I hope the owners address this issue. We camped at Benchmark RV Park in a Travel Trailer. Clean, easily accessible for big rigs. Level paved pull-through sites, FHU, wifi, cable. Very nice laundry ($1.50/$1.00). Nothing much here, mostly just a stopover from Interstate 20. The owner is very nice, helpful. Easy access to Meridian though nothing much there that can't be seen in a day or so. Not a 'campground' more of a stopover on the journey. There are several 'permanent campers' residing here but the park is very well kept. We camped at Benchmark RV Park in a Motorhome. Enjoyed Sunday jazz brunch at Widemann's Restaurant in Meridian historic district; oldest restaurant in MS. A bit pricey but excellent food and atmosphere. Grocery, Walmart, mall nearby. Bonita Lakes is lovely area for outside activities. Gas/diesel fuel across from RV park entrance; could get 40' coach in and out easily. Let's get one thing straight: this is an overnight stay on your way to someplace else. There are no trees, no privacy, no Wi-Fi unless you are near the office and no seclusion from traffic noise. It's a small park with tight turns and gravel roads with potholes that collect water when it rains. 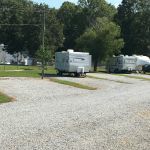 What the park does have is level concrete pads with full hookups, good water pressure, cable TV, pet walk area, laundry, showers, reasonable pricing and attentive management. The park has decided to position itself as a clean, functional, convenient overnight stopping place-and it fits that bill perfectly. Would I stay here again? If I was tired of driving, needed a clean place to spend the night and didn't want to spend an arm and a leg-you bet! One note: if you are using your GPS to find the park, know that it is located in Marion, NOT Meridian, MI. We camped at Benchmark RV Park in a Fifth Wheel. Small campground with mostly pull thru sites. It is a few miles from the interstate but worth the drive. Staff was friendly. Wi-fi works best close to the office. There is a warning sign in the laundry/shower area that water pressure is high and you should use a regulator. We camped at Benchmark RV Park in a Travel Trailer. Site was concrete, there were trees in park, but none at my site. This park was easy to get to, just off the highway. No traffic noise noticed. Interior roads were wide for my 40 ft plus toad. This was good for an overnight stay. We would come again. We camped at Benchmark RV Park in a Motorhome. Park is your definition of average. Nothing spectacular, but nothing terrible. Clean showers, but only 2 unisex bathrooms. Cheap laundry, but didn't always work. Easy to navigate with paved sites, but office is only open 2-3 hours/day. Stayed here a month. 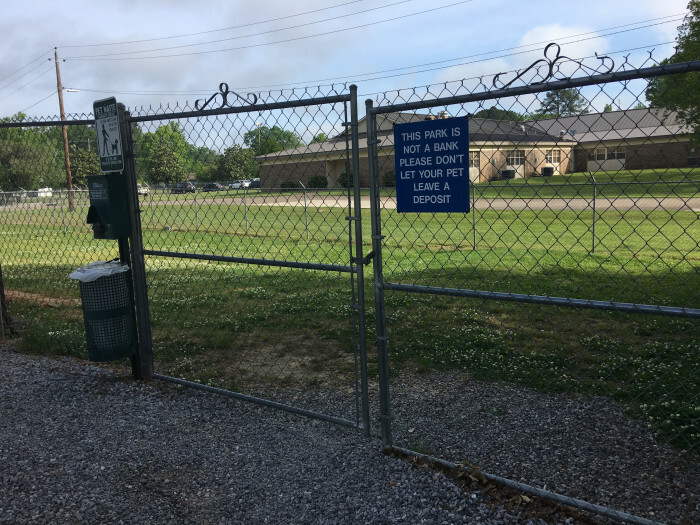 Not many decent parks in the central MS area, so if you're going to be here a while, pick this one. Did hear a train every one in a while, but it didn't disturb my sleep. Very economical park. (Oh, and bring a water regulator) We camped at Benchmark RV Park in a Travel Trailer. We used PA for 1 nite (all they allow) and Escapees for our 2nd nite. This small, no-frills park is an excellent park for a short stay. It is set up perfectly for those in big rigs or small. The sites are not lush...no picnic tables or fire rings, nor any space for them, either. But the long pull-thru sites are easy in-and-out, with a 40' long, level concrete pad located perfectly to park a big rig, with gravel in front and behind, making an overall 70' site. You can leave your toad attached, or disconnect at your site (which we chose to do, as we stayed 2 nites). There's nice grass between sites. All sites have a choice of 30 or 50 amp, sewer, and water. There's also cable and WiFi, but we didn't use either. If you're here for lunch or supper, be sure to try Brickhaus Brewtique downtown. Great burgers and lots of great local beer selections. The artichoke poppers are "da b0mb." Campground sign is well-lit at night. Directions to CG on website are spot-on. Office closed except for a few very specific hours, but assigned sites are posted on door and easy to find in this small gem of a campground. We would definitely stay a night or two if in the area again. We camped at Benchmark RV Park in a Motorhome. Eat Brickhaus Brewtique in town! Good burgers and fries, huge selection of regional beers. Called inroute same day to reserve a site and had to give credit card to hold a $16.50 reservation. Site was ok but cement pad was cracked and not level as well as having several massive anthills full of nasty biting ants. It is handy to the interstate and there's a fuel station/store across the street. We camped at Benchmark RV Park in a Motorhome. Small very nice RV park with primarily pull-thru's. EZ in and out. Cement pads. FHU-50. Quiet. Wifi is good most of the time. Cable. Well maintained. Good internal roads. Definitely would stay here again if in the area. We camped at Benchmark RV Park in a Fifth Wheel. MSU Riley Center is a restored 1800's opera house, Merrehope House and FW Williams House are restored 1800's houses. Merrehope House was one of few in town not burned during Sherman's march. Big rig friendly, park is on slight incline so sites are not perfectly level but jacks correct easily. Wifi is offered but not reliable. Water pressure is good & does not need suppression. Small dog park up near office but large field at back of park for dogs to play ball. Sadly park has breed restrictions. Great over night place to stay with easy access & acceptable distance from interstate. We camped at Benchmark RV Park in a Motorhome. This was on overnight stay on our way home from vacationing. We were at site 12B. The staff was friendly and helpful; concrete, level sites; full hookups; clean laundry facilities and showers. The only "negative" for me was that the clean water and sewage hookups are really close to one another and cross contamination could occur if you are not real careful. This is not a deal breaker for us. We will definitely use this place again in the future. We camped at Benchmark RV Park in a Motorhome. Good Overnight Stop. 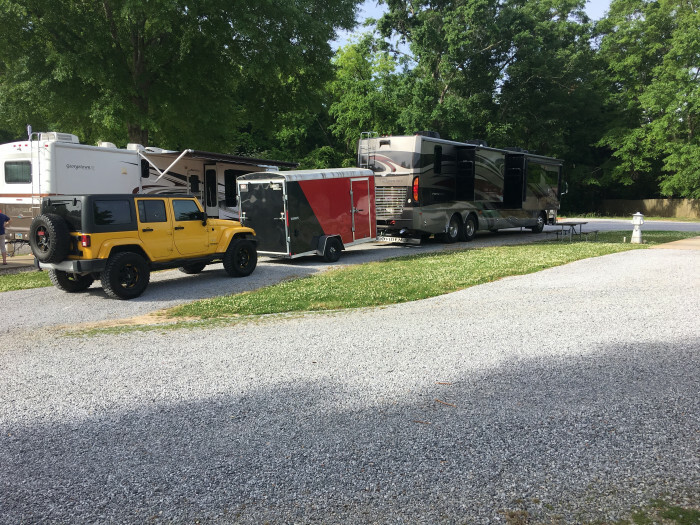 Narrow gravel pull through long enough for our MH, Trailer and Jeep. Easy in/out. No frills, except a nice large Dog Park! Mostly a place to park and rest. It was clean. Office not open much. Would stay overnight again. We camped at Benchmark RV Park in a Motorhome. There's a gas station with groceries on the corner close by. 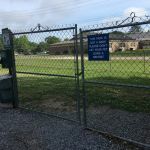 Easy access, very grassy dog park, super water pressure in park shower. When you arrive stay in center lane. Whether you stay in pull-through row A or B, you'll first need to go take the Center lane to the back. Wish we would have known that! The park slopes slightly to the back where lots start with #1. I recommend requesting sites 7A or 7B - 13A or 13B. Not sure if there are any flooding issues in the back. Office is not open at all times but owner is easily acceptable by phone. My GPS took me down a ridiculous route. My advice is to take US Hwy 45 North from I-20 and go all the way to Dale. Turn left. Park is less than 1/4 mile on the left. I recommend this park. We camped at Benchmark RV Park in a Motorhome. Newly renovated Food Lion, Super Walmart and several restaurants nearby. there are no real stores near the park. Go to the Brickhaus for good food and to Weidman's for Black Bottom Pie! This was a stop for the night. We didn't venture out. Approaching this campground from MS Hwy 45 South, after exiting be sure to turn RIGHT at the 4 way stop sign. The campground is approximately 1 mile on the left side. Big sign. Can't miss it. Enjoy. Meridian is a nice town with lots of restaurants and shoping. There is lots to do in Meridian, however navigating this town is not easy to do. To get across the highway requires lots of on's and off's. It even confused our GPS. Six exits for Meridian and this one had the campground and a small Shell station. All other exits have access to fuel and restaurants. Check out the Meridian website for attractions. The Peavey visitor center is no longer open though. I read crime is escalating in Meridian so I didn't feel to secured in this noisy campground. There is a Shell station directly across the road that has diesel and the park had several big rigs in it. Not far off the highway, either. 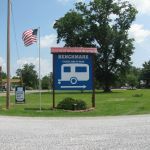 Are you affiliated with Benchmark RV Park ?